While some children love nothing more than sitting down with a blank sheet of paper and a pen, others are filled with dread at the thought of writing much more than their name at the top of their worksheet. Teacher and author Alison Wilcox shares her tips for encouraging the writing bug. Although some children love writing stories, poems and letters, others would – let’s be honest – rather be playing on the computer or building Lego models. But with the right encouragement, even the most reluctant writer can enjoy the creative process of writing. To inspire a child to write, the task in hand needs to be meaningful. This means telling them what purpose their writing will have (are they writing a short story, a newspaper article or instructions for a computer game?) and who the audience is. Letting your child choose their own subject to write about, which taps into their life and interests, will also fire their enthusiasm. So how can you encourage them to pick up a pen and unleash their inner author? The internet provides children with lots of great opportunities to write with a purpose and for a real audience, which can turn them into engaged and enthusiastic writers. Setting up a blog where your child can write about family events such as holidays, celebrations and days out is a good way to get them into the habit of writing regularly. There are also lots of websites where children can write reviews of video games, books, films and TV programmes. Writing a blog is a brilliant activity to share as a family: children rarely see adults writing for pleasure, and it gives you the opportunity to demonstrate writing skills like how to construct and redraft a text. If your child feels strongly about a particular cause such as animal welfare or child poverty, channel their passion into writing campaign materials. Charities such as the RSPCA, Born Free, WWF and ActionAid have lots of useful ideas for getting children involved in raising awareness of their campaigns and funds for their projects, such as by writing to their MP or designing their own posters. What was the world like when Grandma was a schoolgirl? Talking to family members and collecting stories from their childhood is a great source of inspiration for your budding writer. Encourage your child to interview relatives about their experiences growing up, and then compile the stories into a family journal. This is a fantastic project to work on with your child, giving you the opportunity to model writing skills and styles while also preserving family memories for future generations. Computer games and creative writing may seem a world apart, but Minecraft, Mario Kart et al can be a great way into writing for tech-addict kids. As well as writing reviews or blogs for other users, your child could design their own game, or add another level to an existing game. This gives them invaluable practice in developing settings, characters, plot and effects, and also provides the chance to try out descriptive vocabulary, using words to bring their vision to life. The activity can naturally be extended, for example by writing a blurb about the game, instructions and promotional leaflets. It’s easy to be snobby about comics, but they’re a source of endless entertainment for children, and the recent surge in popularity of graphic novels has widened the genre still further. If your child is discouraged by the thought of writing long tracts of text, producing a comic is an ideal way into creative writing. Comic Master is a free tool designed for children to create graphic novel style comics, selecting from a variety of layouts, backgrounds, characters, effects and fonts. You never know, your reluctant writer could become the next Jeff Kinney! 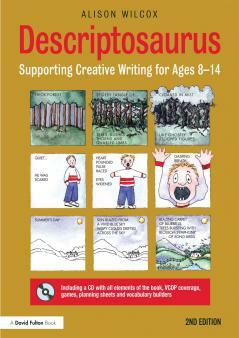 Alison Wilcox is author of Descriptosaurus: supporting creative writing for ages 8-14 (Routledge, £29.99). Alison has extensive teaching experience in schools in England and Scotland; colleagues describe her methods as 'innovative and inspirational to even the most reluctant of writers'.